In 1980, we bought our first sailboat. We named her the Last Straw. It was primarily based upon a play on words using our last name. In 1985, we bought a Robert Perry designed Tatoosh 42, which was already named Fringe Benefits, a name we liked and decided to keep. But, in our opinion, she wasn’t the ultimate cruising boat for crossing oceans. So, we started looking for a boat that we would be able to comfortably and safely circumnavigate on blue water. When we found her in 1998, we decided to name her something different and unique. We decided on the name Final Straw for several reasons. 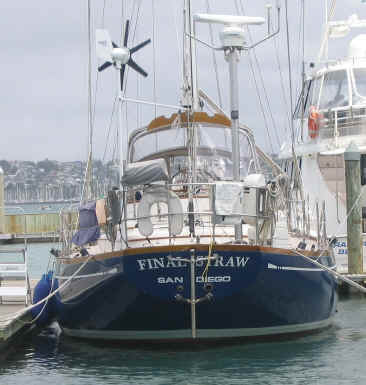 Prior to finding her, we had looked at many other boats, traveling from Florida to Annapolis to San Francisco, all spanning a timeframe of over two years. It was a fun, but, in some ways frustrating experience, somewhat akin to house hunting. The day we found her, we were in nearby Dana Point, California. Suzy simply had no qualms that this was the right boat. Although I was partial to an aft cockpit design, I agreed this boat had a better layout and was much better equipped with beautiful lines and better than anything we had seen to date. We concentrated on looking at Mason 54’s after reading an article in Cruising World about the best cruising boats. The author had selected the Mason 54 as best in class with the highest score of any boat in the 50-55 foot category. He used a statistical process called fuzzy logic which analytically evaluates all the important parameters one would look at in the selection process. It included, the boat’s comfort, safety, ease of handling, sailing characteristics, construction, etc. After we bought her and sailed her, I grew to enjoy her even more than I expected and have now changed my mind about a preference for an aft cockpit boat. Visibility and dryness are two good reasons a midship cockpit makes sense. In summary, for us, she was the "final straw" in our decision making process. After settling on the name, we searched the U.S. Coast Guard Vessel Registration website and found there were no other vessels documented with this name. So, she became the first U.S. documented vessel to bear the name of Final Straw! She was officially documented on September 24th, 1998 with home port of San Diego, California.